Upon logging in you are taken directly to the Dashboard. 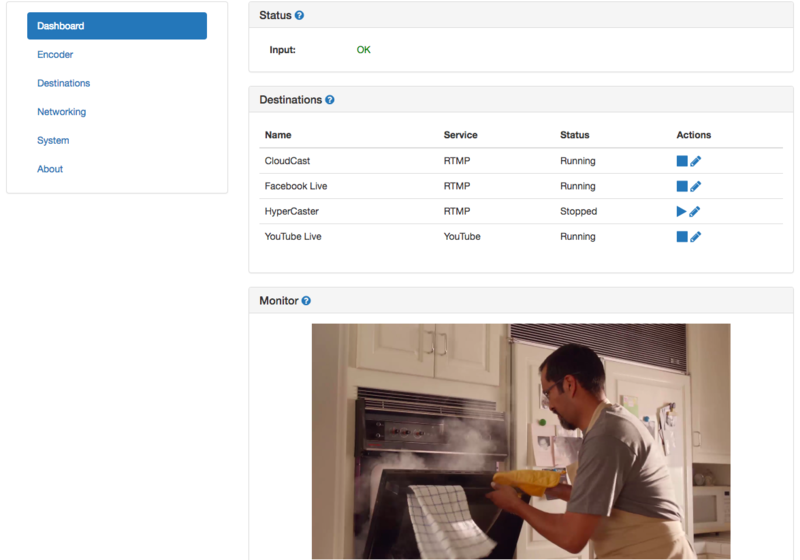 You can also navigate to the Dashboard by selecting the Dashboard menu option. With the mobile-friendly, responsive Web User interface, you can access and manage your TelVue TeleCast 2 no matter where you are. Easily start and stop streaming specific events to YouTube or Facebook Live with the click of a button right from your mobile device while streaming 24×7 to TelVue CloudCast for example. Input status displays whether the encoder A/V input is detecting a valid signal. The input status will dynamically update based on signal presence. OK means a valid A/V input signal is present, WARNING (no input) means a valid A/V input signal is not present. Name: The name of the destination as configured. 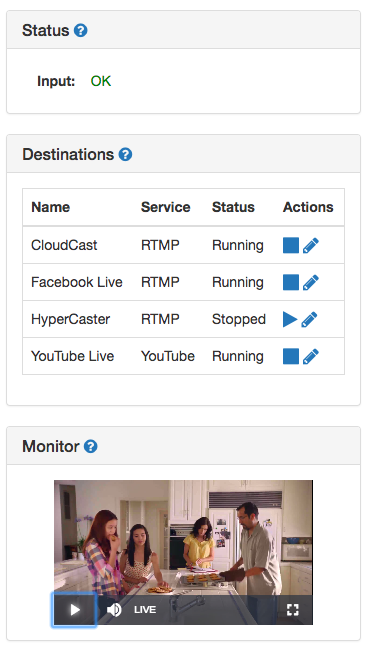 Service: The service type, one of RTMP, CloudCast, Facebook, YouTube. Status: Indicates whether the encoder is currently streaming to the destination, either Running (streaming) or Stopped (not streaming). Actions: If the Destination is Running, the Stop icon will be shown. Clicking the stop icon will stop streaming to that Destination. If the Destination is Stopped, the Start icon will be shown. Clicking the start icon will start streaming to that Destination. Clicking the Edit icon takes you to the Destinations page ready to edit that Destination. Displays a preview of the encoded stream. For adaptive configurations only the top, highest rate is displayed. The monitor preview is typically delayed by up to 10 seconds from live for local buffering to minimize player buffering when watching from a browser over the network. Click the Play button to begin monitoring, after which you can use the player Pause/Play control to pause and resume, Volume control for setting the preview audio levels, and full-screen control to enter and exit full-screen. The Monitor allows confidence monitoring from any connected PC, laptop, tablet, or mobile device, even remotely.